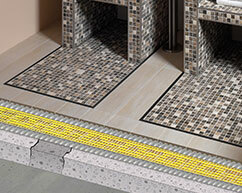 CI+ Matting is an underlay for natural stone coverings and ceramics. It is very simple and economical to use. It acts as a crack isolation / decoupling layer separating the surface covering from any stress that may be occurring within the substrate. Typically this would be on wood based floors and those with under floor heating systems and fresh “green” screeds. 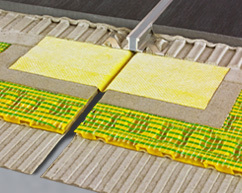 The use of CI+ matting separates any movement in the substrate from the rigid surface. This is particularly useful where naturally occurring fault lines in the material makes these surfaces prone to cracking. The fixing method is as for standard applications. However we would strongly recommend that a good quality flexible adhesive and grout be used for maximum preventive protection from cracks. Movement joints can be seen as an ugly intrusion into an otherwise attractive floor. This is a serious issue with floors that use natural materials. The variable nature of these products means that they are considerably more prone to cracking due inherent faults within the material. There can therefore be a reluctance to confront the need for these products. The consequences of which are that floors fail unnecessarily. 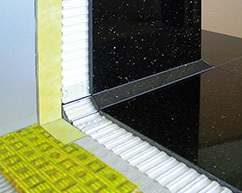 Through a unique manufacturing process we can supply colour co-ordinated products that can be tailored to match the surface of the stone. The difference between a standard movement joint and a bespoke product in situ has to be seen to be appreciated.